There’s long been a far-fetched rumour that Adobe intentionally leaks pirated copies of Photoshop and Illustrator to hook young, aspiring artists on its software before they transition into careers as professional designers. Still, many of the professional design hardware remains quite expensive for students and other people who don’t have a business to pay for their kit. 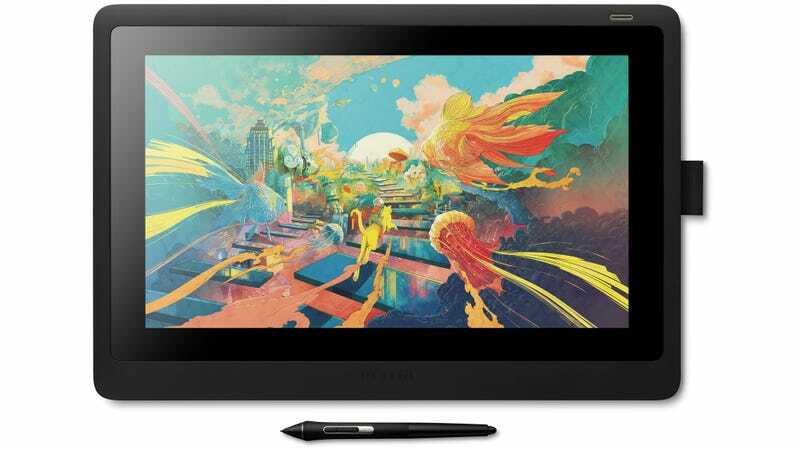 At $649 ( £507, UK pricing TBC), the latest version of Wacom’s touchscreen drawing tablets, the Cintiq 16, is now the cheapest way for aspiring artists to master what has become an industry-standard design tool. As with the company’s pricier Cintiq Pro line, the Cintiq 16 uses Wacom’s wireless electromagnetic resonance stylus technology which, in layman’s terms, means it doesn’t require a battery and never has to be recharged. The stylus offers 8,192 levels of pressure sensitivity, tilt recognition, and a set of buttons that can be programmed with custom functionality, including a virtual eraser on the end. The Cintiq tablets work as secondary screens for a laptop or a computer, allowing artists to directly interact with a digital creation using the stylus. So the new Cintiq 16 will work with every design and drawing application that Wacom supports, including everything Adobe makes. But unlike alternatives such as the iPad Pro, which works with the Apple Pencil stylus, the Cintiq 16 isn’t a standalone computing device. Without an accompanying computer, it’s just a big ol’ slab of glass. The new Cintiq 16 also comes with other tradeoffs when compared to Wacom’s similarly-sized £1,300 16-inch Cintiq Pro. The Pro boasts a 15.6-inch display with a resolution of up to 3840 x 2160 pixels, while the Cintiq 16 tops out at 1920 x 1080, limiting how much you can see on its screen at any given time. The Cintiq 16 can also only display “72 percent NTSC colour” which is a roundabout way of saying it will properly display 100-percent of the sRGB colour gamut. In comparison, the 16-inch Cintiq Pro can display 94-percent of the broader Adobe RGB colour gamut. So what does that mean for aspiring artists? The Cintiq 16 will be more than adequate if you intend to share most of your digital creations online. But if part of your creative process involves photography, and complex post-processing of photos, the Cintiq 16 might not be ideal for color-proofing images before they’re sent to the printers.